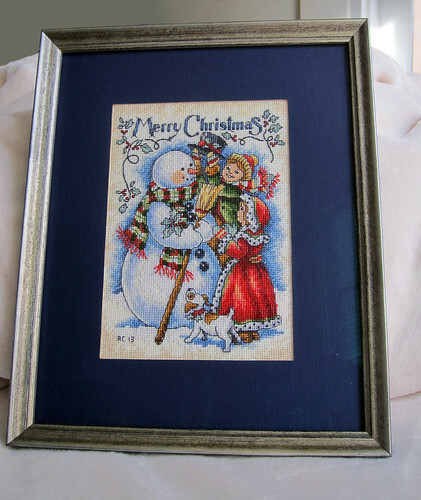 Sometime late last year, I took a look through a pile of half finished cross stitch projects and decided it was high time to finish a few of them off. In the early part of the New Year, I stitched, mounted and framed three projects that have been hanging over me for quite some time. The first is a Dimensions Gold Collection kit called a Vintage Merry Christmas that I picked up about 6 years ago at a craft fair with the intention of giving it to Kelsey for her (then) new home. All that was left was a few hours of back stitching. I finally gave this to Kelsey last weekend so I can actually share it with you. 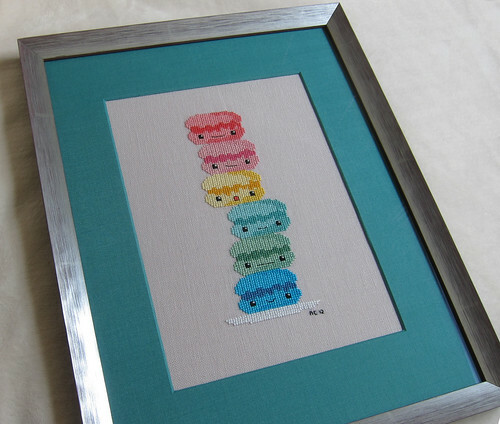 Up next was the Leaning Tower of Macaroons by the Frosted Pumpkin Stitchery which I started (and finished stitching) back in early 2012. It only took about an hour to block and mount it for framing. I love the way the pearl colour of the linen sets off the bright colours of the macaroons. 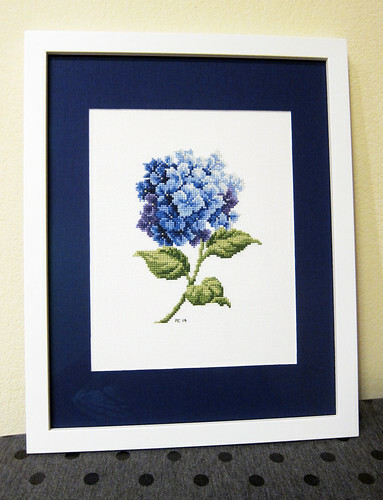 Lastly was a blue hydrangea cross stitch kit that I picked up at Liberty of London in late 2011. I bought it with an flower loving, English-born friend in mind. At the time, it was an attractive option because it didn't require a single bit of dreaded back stitching. 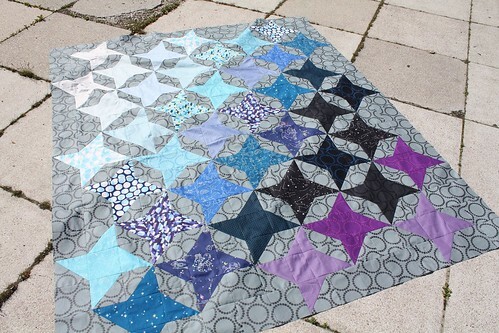 I swapped out the original aida for a white evenweave fabric for a more polished background. Blocking, mounting and framing these projects really made them shine, transforming them from a rumply uneven-looking pile of mess into beautiful finished products. It felt great to focus on each project until it was finished instead of flitting between six different projects. Hoping to carry this strategy forward so that I can have a couple more needlework finishes to show you before the year is out. Both Kelsey and I found ourselves in friendly Manitoba for Bree's wedding last weekend. 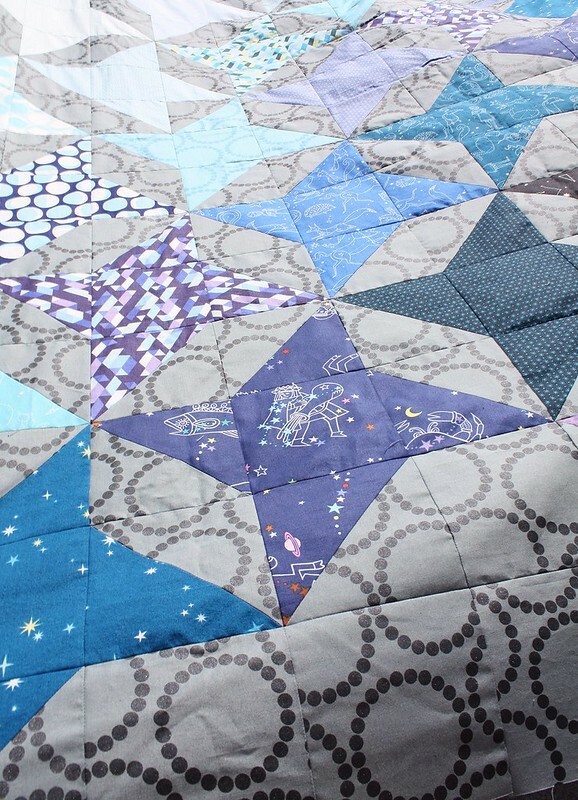 Despite a fairly tight timeline, Kelsey somehow managed to finish Bree's wedding quilt with time to spare. In short the wedding was amazing. In true Bree fashion, every detail was perfectly planned and beautifully executed. We were both in the bridal party so unfortunately, you'll have to console yourself with quilt photos since I have absolutely zero wedding pictures to share. Even the unplanned details were perfect. About 20 minutes before the outdoor ceremony, the skies opened to offer a torrential downpour with a side of hail as a wedding gift to the bride and groom. Although Bree and her new hubby got stuck in the worst of it, they were instantly greeted with teams of family volunteers to towel them off and wash the mud off of the bride's dress. While they were being tended to, all remaining warm bodies sprang into action and managed to transform an old (and leaky) tractor barn into a Pinterest worthy ceremony site. I can honestly say that I've never seen rough and tumble farmers take draped burlap, lace and paper poofs quite so seriously. Totally heart wrenching (in a good way). And if that wasn't enough to warm your hearts, our grandmothers (one bio and Bree's gran that we've adopted as our own) offered marriage advice from their collective 115 years of marriage that brought on the tear equivalent of the torrential downpour outside. It was epic. I can't wait to see the video. Back to the sewing. 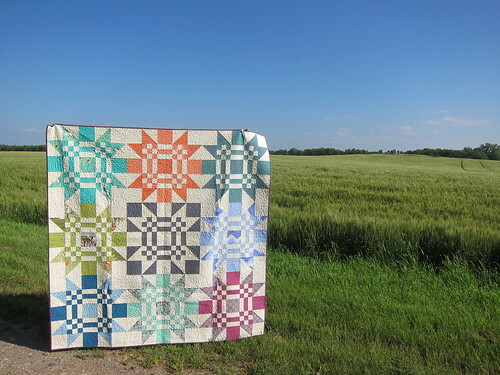 The quilt turned out beautifully and I think it meant as much to Bree to receive it as it did to us to make for her and her Mr.
Kelsey opted for an all-over stipple to avoid competing with the bold piecing of the large blocks. 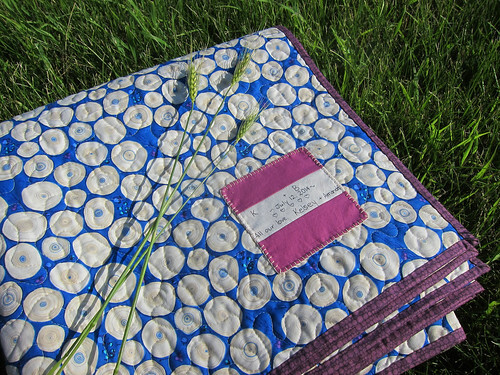 It gave the quilt a beautiful texture. We backed it with some of Martha Negley's Tree Rings print which seemed fitting for the occasion. I made a simple label out of some of the leftover scraps from the top and sent it to Kelsey with my blocks. 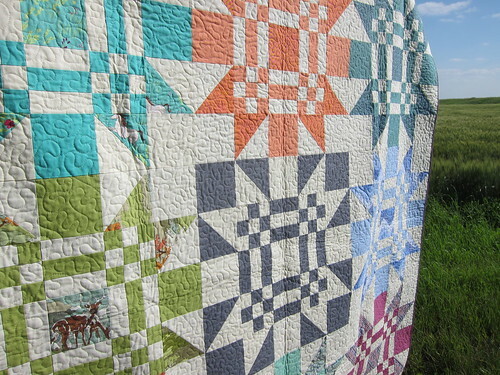 She sewed it onto the back of the quilt and blanket stitched around the edges to jazz it up a bit. 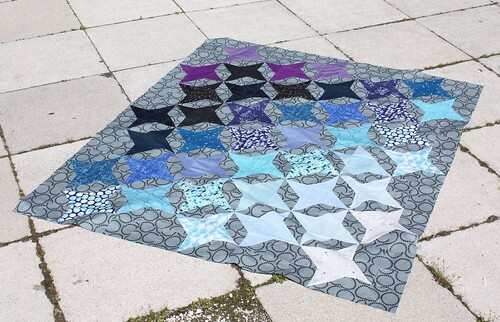 Fabric: A random assortment of solids from the Fox Field coordinating solids bundle from Pink Castle Fabrics and stash prints, Moda Bella Solid in Snow for the background, Martha Negley Tree Rings in blue for the backing. Lastly, a dorky picture of the two of us taken with a self-timer and a camera that was precariously balanced on the hood of a car. Not too shabby if I do say so myself. Looking at these photos makes me wish I was still home in Manitoba. That prairie sky definitely gets under your skin. This year I set two challenges for myself. 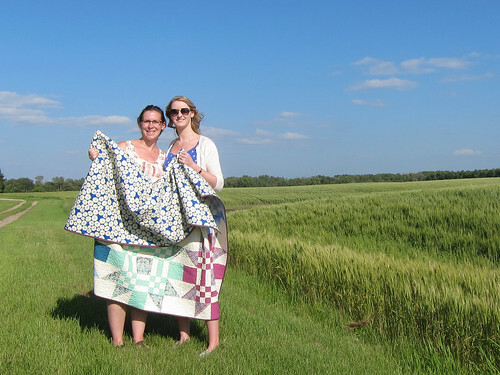 The first was to track how much fabric I used in a year and the second was to finish 12 quilts and 12 pieces of clothing over the course of the year. Although things started on the right foot, I quickly fell behind as things started to get crazy in March. 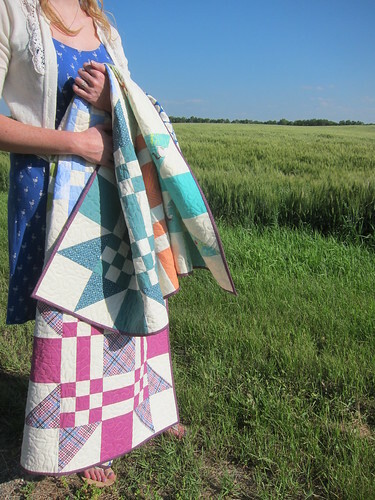 To date, I've finished three quilts and two pieces of clothing. 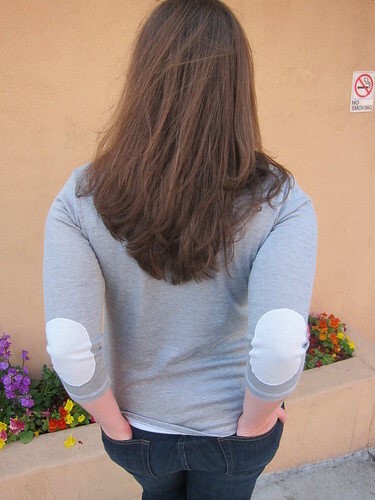 The second is the Plantain T-Shirt, a free pattern offered by Deer and Doe, opting for the 3/4 sleeve. I used a shimmer pinstripe jersey knit. 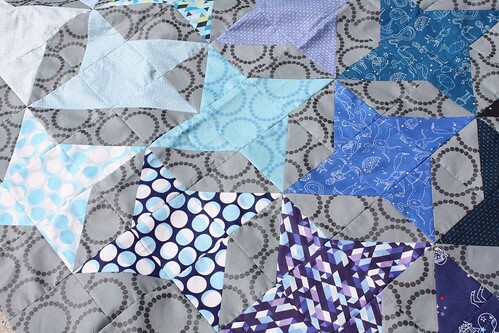 It's a two-sided fabric which means that it is a reversible mid-weight. I ended up using the sparkly side of the fabric for the elbow patches. I ended up just sewing them on with a ball-point needle and a small, tight zigzag stitch to finish the edges. As always with knits, this top was fast, easy and satisfying. The fit turned out all right considering the lack of modifications to the pattern and my general disregard for anything resembling accurate body measurements or a muslin. I've gotten quite a lot of wear out of this top since finishing it in February. I can see myself making a few more of these tops for next winter. Here's hoping I can get caught up on my 12 in 12 goals over the next few months. 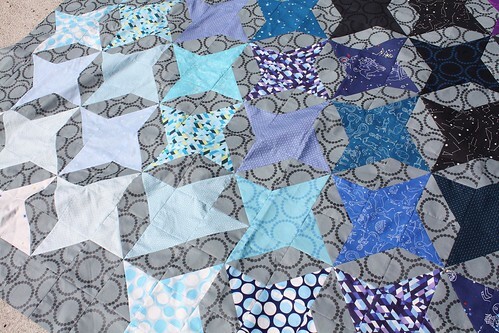 I started quilting a baby quilt last week and cut out some fabric for a new dress. More on those soon!